HALBAN Designing a future district of Muscat that was the task given to five high school students on the first day of their work and study experience days at GUtech. In the department of Urban Planning and Architectural Design the students got some insights about the work of architects and urban planners. Within a few hours the students developed their own models of future city districts and they presented their ideas to a small jury of staff members. “What the students have learnt today is to realize a diversity of designs. 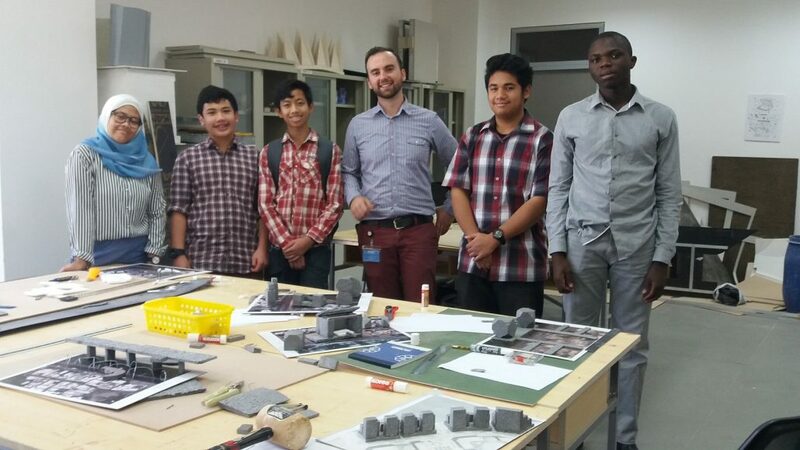 We give them the freedom to use their ideas to create their own designs and develop the areas where they thing that should be new features for all society – within “Muscat – future city”, said Petrit Pasha, Lecturer in the Department of Urban Planning and Architectural Design who supervised the school students. All students integrated renewable energy resources in their urban models. They realised a mix of residential, work and leisure areas all located close by the sea and they. Shabrina Wiendrarko who won the competition introduced two main opponents, Oman as a Tourism hub and Hydro Energy. She thought of a hotel resort and hydroelectric power generation beside the sea. Jeffery Oguni designed a futuristic style of houses connected by several bridges. He also included houses made of so-called ‘solar bricks’ that store solar energy. Zidan Rafliansyah integrated solar panels on roof tops to decrease CO2 emissions and pollution. He also integrated public parks and office buildings with a view to the sea. Rokhy Musthofa created a model with high-rise buildings and a seaside promenade shaped like an Omani khanjar. Rafif Suwardoyo thought about electromagnetic trains used as public transportation, public swimming pools and other social activity buildings such a University and a sports hall. The students said that they wish to present their urban ideas to their school colleagues in the coming weeks. For all students it is their first experience at a university. During three days at GUtech the school students are familiarized with different departments, study-programmes and the overall student life on campus. “The aim of the Year 10 Work Experience is to give the students an insight into the real world of work and develop their personal, social skills and confidence. It allows students to learn about the different roles and structures within an organisation. At the same time it is a unique opportunity to learn more about themselves and discover what really interest them by finding out about different occupations and job groups. This will allow to develop future career plans and enhance their career aspirations,” said Ajay Khushalbhaia, student counselor at the British School Muscat. The second day they will be in the Engineering department and the third day in the Department of Applied Geosciences and they will get a chance to attend the international event at GUtech in the afternoon. GUtech offers Bachelor of Engineering and Bachelor programmes in Mechanical Engineering, Process Engineering and Environmental Engineering as well as Bachelor of Science programmes in Applied Geosciences, Computer Sciences, Logistics, International Business and Service Management, Urban Planning and Architectural Design. All programmes are taught in English and are internationally accredited by ACQUIN.